Synchronicity in granite – For the fainthearted . 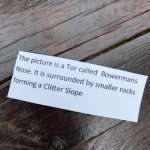 . .
Bowermans Nose stood on a hillside just beyond the school grounds. It was an outcrop of granite rocks that looked like the work of some ancient civilisation. In profile, the outcrop looked like the cartoon character Yogi Bear, with its nose and peaked cap. The name of an animated figure on television seemed much more interesting than the proper name for the outcrop, and most of the boys at school would have spoken of “Yogi Bear” rather than the seemingly dull Bowermans Nose, which would only have been used when entering it in the school exit as a destination for a walk on a weekend afternoon. Yogi Bear seemed to stand and survey the landscape from his elevated position, impassive, unmoved, indifferent to the lives of those who passed back and forth along the narrow roads. Yogi Bear seemed emblematic of the moor itself, a rugged and harsh and unforgiving place. But why had Yogi Bear been important to the reader of the geography notes, important to the point that they had neatly cut out the caption to the picture, but had then cut the caption from the picture? What was the significance of Bowermans Nose for a student at a school in a different county? The psychologist Carl Jung coined the term “synchronicity” for moments that had no causal relationship, but were connected in meaning, An online conversation about the school, followed by notes on a feature that was part of the school landscape, but which had not been discussed since the time of leaving the school forty years ago. There could be no causality, but the moments seemed connected in meaning. Jung used his idea of synchronicity to argue for the existence of the paranormal, it seems an unnecessary conjecture. Everyday there are countless events encountered, countless moments that have the potential for connection with other such moments, but there are no links. In the abundant experience of everyday life, it seems likely, logical even, that there should at least be some moments that are apparently connected, moments like discussing a school and then seeing mention of a landmark beside it. The moor could be a dangerous place, Bowermans Nose, and the countryside around it, taught the importance of a grasp of firm concrete reality, or, in this case, granite reality. In a place of sharp frosts, severe snows, bitter winds, and long-lasting winters, idle speculative thought could be bad for one’s health. 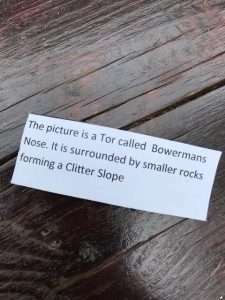 The conjunction of discussion of the school and the finding of the notes on Bowermans Nose are a coincidence, they are not even events connected in meaning. Synchronicity is reading into a moment a significance that does not exist. I think a lot of Jung stems for the era he lived. Or rather the era just before. We forget the largest, and largest by far, of those that entered the US from 1850 came from German speaking lands. And we also forget that Germany with Austria reorientated at least six times since 1800 with a new structure each time. So while you might be brought up to think of you and your family as a defender of the Land/Church/People and in the case of Austria the first line of defense against the Turk. But on the whole we are speaking about changes in the purpose of a strand of society and they didn’t have the tools to re-tool. A bit like all the people who saw their life being district commissioners/magistrates in the Imperial service that didn’t know what to do when the empire vanished in an English context. Or the people on these islands still awaiting the call when all the dressage skills they’ve been drilling into nags become useful and they can charge the guns again. I believe Jung failed because he forgot that the human is social in it’s natural state. But if that state is manipulated by unclear goals we become maladjusted. Indeed I think Brexit and Trump are but visual specters of that problem that’s seen the collapse of the clear economic goals that in the past kept people relatively safe, house/land ownership, sound steady job with a pension, education. As to synchronicity in Jungs meaning. Our Cherry blossom is a few days later than the Suir valley, and a few days earlier than Kilkenny. But you would be a few earlier than Tramore. Jung saw only the trees nearby. It seems almost as though Jung wanted to recover the security of his childhood beliefs passed to him by his pastor father.